Water heaven. 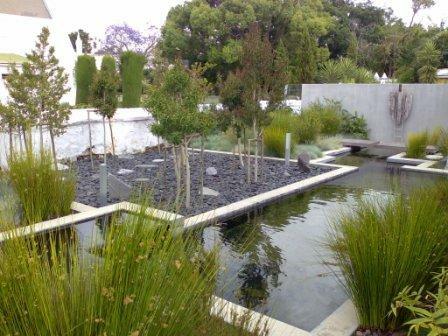 Clayton Laue’s gold medal winning modernist water garden in Stellenbosch uses grasses and water-permeable pebbles. Decorex (23-27 April) opens at the Cape Town International Convention Centre this Friday and promises to offer gardeners a host of green design ideas, designer birdhouses, prefab wet wall water features, Victorian romanticism, fantasy and all things feathered. With the theme, ‘Breath of Fresh Air’, the show hopes to reflect the green movement’s influence on new trends such as frugal chic, re-cycling, up-cycling, salvage design and cutting-edge DIY. This back to basics theme reminds one that even in the garden, you can ‘reuse the past, recycle the present and save the future’. Top local landscaper, Clayton Laue of Paarman Landscapes will spearhead the landscaping industry’s participation this year. A trained landscape designer with extensive experience in indigenous flora, Clayton has been landscaping in the Cape since 1999. At the 2008 South African Landscapers Institute (SALI) Awards of Excellence, he was honoured as a top Gold Medal winner for the installation of a garden in central Stellenbosch. “The owners wanted a low maintenance, simple garden with a Zen feel”, says Clayton, recalling his prestigious national award. “Interestingly, that garden had no lawn at all”, he adds, referring to an issue increasingly addressed by eco-conscious landscapers. The result was a tranquil garden with a large expanse of water designed in a geometric pattern. “It was a once in a lifetime opportunity for us”, he says. Clayton’s website (www.paarmanscapes.co.za) includes a gallery of photographs that reflect work commissioned by his landscaping company since then. As one of the signature landscaping designers taking part at this year’s Decorex, his garden exhibit was planned months ago. “Our garden will combine the natural elements of wooden decking with a unique and eye-catching cascading water feature that will inject movement and sound into the design”, he says. “Our planting palette is restricted, with the emphasis on low-maintenance, architectural, textured and colourful plants. “Visitors will be able to sit on our benches and we will also have edible plants in simple planters”, he says. “Most importantly, we will also be showcasing the versatility of prefab wet wall water features”, he concludes. * Always make sure your water features are custom built so they are unique and make sure that they don’t leak. * When installing wooden decking, always use timber from renewable sources and never use materials from exotic indigenous forests. * Take a good look at the areas between your hard (paving, paths) and soft (plants) landscape areas. Paving should never overpower the plants in the garden – and vice versa. A sense of scale is very important in any garden. * Keep your planting designs simple and your hard landscaping low maintenance. The combination of both should always create a visually pleasing and interesting design. * Incorporate natural products such as stones, pebbles, gabions and cladding into your designs. * Add indigenous plants, restios (grasses) and succulents to your landscape to create a tranquil, but water wise environment. * Using fragrant and fruiting plants to attract birds and wildlife into the garden to encourage biodiversity and conservation. * Discover the benefits of using recycled materials as focal points or art in your garden.